Complying with Strict Conditions of Conservation? In February 2001 the Irish Times reported that Syngefield, County Offaly was being offered for sale. The mid-18th century house had stood vacant for more than two decades, and inevitably was in poor repair as a result. Once surrounded by a substantial amount of land, it now stood on five acres, with factories on either side of the drive, and the outbuildings already sold off. Meanwhile much of the house’s original interior had been either vandalized or stolen – all the chimneypieces were gone, for example – but enough remained, as photographs taken at the time can demonstrate. Most of the main staircase was intact, along with windowcases, lugged architraves, floorboards and some plasterwork. Of particular interest in the Irish Times feature was the information that whoever purchased the property ‘will have to comply with the strict conditions of conservation. 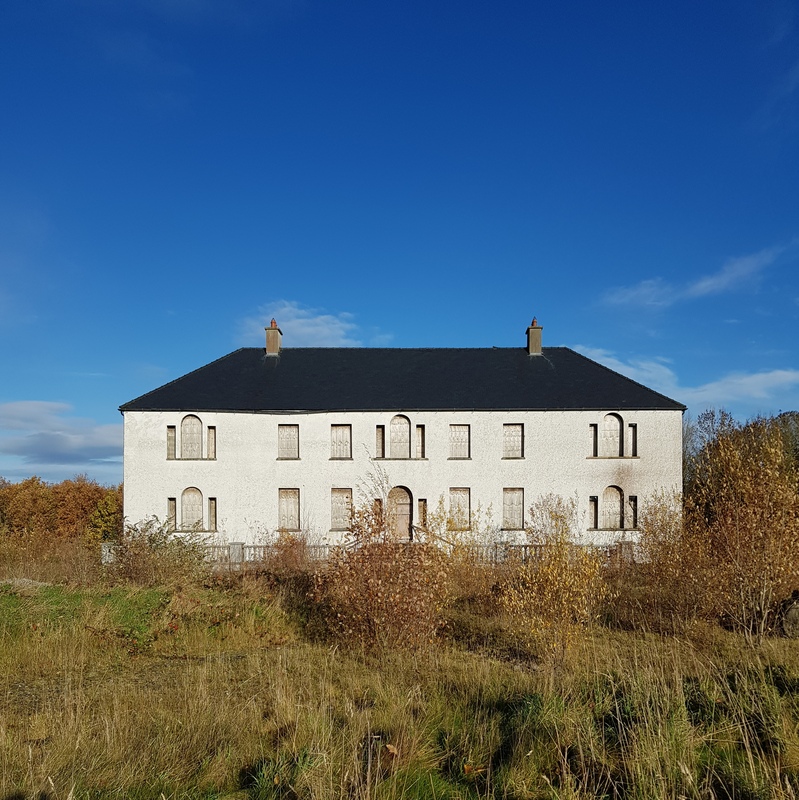 Birr Urban District Council sought the advice of the Heritage Council and the property has been assessed by an independent conservation service.’ Hence while the guide price was low – in the region of £150,000 – the costs of bringing Syngefield back to life would be considerably higher. As is so often the case in Ireland, the origins of Syngefield are unclear. It belonged to a branch of the Synges, cousins of the playwright John Millington Synge, and the house appears to have been built in the middle of the 18th century, perhaps around 1752 when Edward Synge married Sophia Hutchinson. There were many Edward Synges during the Georgian period, almost all of them Anglican clergymen: this one was the grandson of Edward Synge, Archbishop of Tuam and nephew of Edward Synge, Bishop of Elphin and son of Nicholas Synge, Bishop of Killaloe. It was therefore almost inevitable that he too would join the church, becoming archdeacon of Killala, as well as rector of Birr, County Offaly, hence the construction of Syngefield. His eldest son, another Edward, followed the family example and became an Anglican clergyman but a younger son, Robert, became a baronet and it was his family that continued to live in the property. At the time the Synges owned land not just in Offaly but also Counties Meath and Cork. Descendants appear to have remained in residence at Syngefield until c.1870 after which the house was sporadically let, and then sold in the last century. Syngefield was a curious house, owing to its lop-sided appearance. Of two storeys over a semi-raised basement, it had six bays, that to the furthest left featuring Venetian windows on both ground and first floors, aping one on the upper floor above the entrance doorcase (Another oddity were the Diocletian windows in the basement.) A number of writers have proposed that a matching bay at the other end of the house had been built, thereby completing the symmetry of the façade, but that this was lost in a fire at some unspecified date. However, just as possible is that the original mid-18th century house comprised the five centre bays. The left-hand bay is a later addition, with a match at the other end of the building intended but never built owing to shortage of funds, a not-unusual situation in Ireland. In any case, when a new owner acquired the property in 2002, he decided to finish the house as was once perhaps conceived by tacking a new bay to the right of the existing property. He also doubled the size of Syngefield thanks to a vast extension at the rear that was to include a basement swimming pool, home cinema, ballroom and more bedrooms: readers can judge for themselves whether this work complied, as the Irish Times had reported would be the case, ‘with the strict conditions of conservation.’ This job, said to have cost in the region of €1 million, was never completed, presumably owing to the onset of economic recession, and in October 2009 Syngefield was offered for sale again. There appear to have been no takers, because today the unfinished structure stands with exterior and interior alike bereft of every original feature. How is it that what was intended to be a model of correct conservation came to look like this?